Daemons in OS X are system-wide services that are launched at system start-up. They are managed by a program named launchd which was first introduced in OS X 10.4 Tiger. Services that are run on a per-user basis are known as agents, but are still managed by launchd. From a user’s perspective, launchd replaces the more traditional cron. To have launchd start XAMPP’s Apache server as a service we need to create a launchd configuration file. This configuration file has a .plist extension, a format familiar to many OS X users. launchd configuration files can be placed in one of three folders determining when and for whom the service will start. Any text editor will allow you to create the necessary configuration file, but you’ll be asked to authenticate if saving the file in either the /Library/LaunchDaemons/ or /Library/LaunchAgents/ folders. You can use a text editor like Smultron by Peter Borg which will allow you to authenticate. I’m sure there are others. There’s also a great little app called Lingon, coincidentally by the same author, which makes the whole configuration a snap. Whilst both Smultron and Lingon are free they’re unfortunately no longer being developed. However, the latest (last?) versions of both run fine under OS X 10.5.8 Leopard 0S X 10.6.2 Snow Leopard. The configuration file I’m going to create will start XAMPP’s Apache server as a service at system startup. In Terminal I’d type /Applications/XAMPP/xamppfiles/xampp startapache to start XAMPP’s Apache server, so this is the command I’ll include in my configuration file. There are other options available, but I’m only concerned with starting Apache. A full list of parameters can be found here. If you’re using the standard Apache port 80 in XAMPP or any non-standard port below 1024 then you’ll need to place the configuration file in the /Library/LaunchDaemons/ folder. This is because XAMPP requires authentication to use ports below 1024 and a configuration file in the /Library/LaunchDaemons/ folder will run as root. If you place the configuration file in either of the other two folders it won’t be able to authenticate and the Apache server won’t start. To start creating the configuration file, open Lingon and click the New button at the top-left corner. Lingon will ask where you want to create the configuration file. Select Users Daemons and click Create. 1. Ensure the Enabled option is checked. If later you wish to disable the LaunchDaemon simply uncheck this option. 2. Enter a name for the configuration. I’ve called mine apachefriends.xampp.apache.start. Lingon will add the .plist extension for you. 4. We’re only concerned with the Run it when it is loaded by the system (at startup or login). All other options should remain unchecked. That’s it. Save the file and you’re done. Whenever you reboot your Mac, XAMPP’s Apache server will be up-and-runing when you log-in. 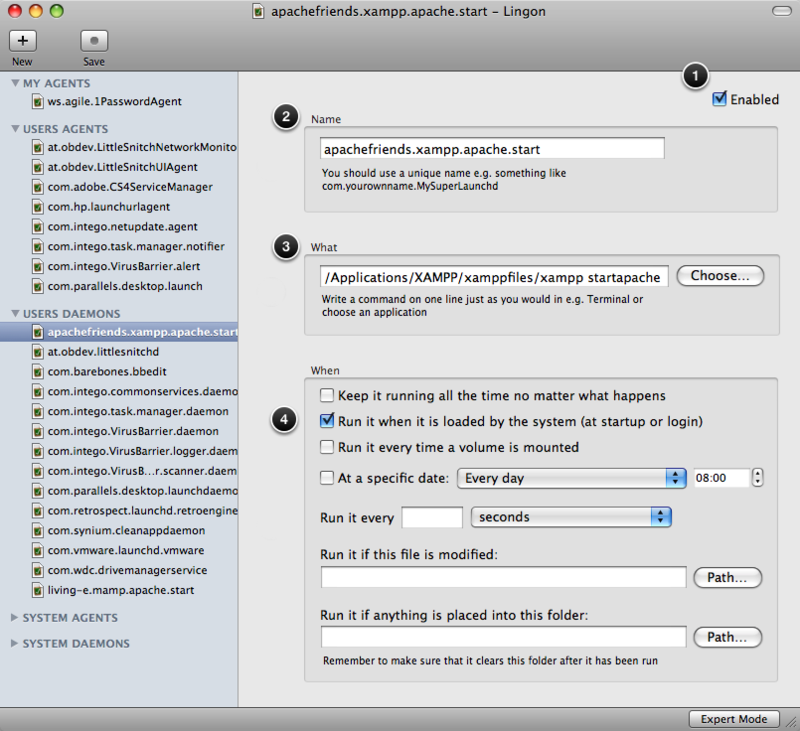 If you navigate to the /Library/LaunchDaemons/ folder you’ll now see the apachefriends.xampp.apache.start.plist file. As an alternative to creating the configuration file with Lingon, simply copy and paste the code block above into a text editor and save the file as apachefriends.xampp.apache.start.plist in the /Library/LaunchDaemons/ folder. This step is optional and only for the terminally lazy like me. If you want the XAMPP Control.app opened when you login simply add it to the Login Items in System Preferences > Accounts > your account > Login Items and set it to Hide. These instructions are only for Leopard and Snow Leopard using XAMPP 1.7.2a. There appears to be an issue with the method described here if you’re using XAMPP 1.0.1 with Snow Leopard (and possibly Leopard). See the Comments section below for a possible workaround. apachectl start is actually the command executed by ../xampp start and ../xampp startapache. It’s actually the latest – but I have a weird of combo of 1 and 1.7 since I need(ed) to run php – maybe that was an issue. Anyhow – snow leopard has a nice php build finally with many extensions and mysql has a dmg for 64 bit so I switched back to native and it was a breeze. Much better than what came with leopard/tiger. I used your launchd configuration file as-is with XAMPP 1.7.2a and all three servers started. You said in your initial post that you’re using the latest version of XAMPP, but the first line of your system log shows XAMPP 1.0.1. So I installed XAMPP 1.0.1 and ran your launchd configuration file again and got the same errors you’re getting. Using XAMPP 1.0.1, if I run sudo /Applications/XAMPP/xamppfiles/xampp start from Terminal all three servers start as expected, but if I try to load the configuration file from Terminal: sudo launchctl load /Library/LaunchDaemons/apachefriends.xampp.apache.start.plist I get the same errors for Apache. So, the problem is with the configuration file and XAMPP 1.0.1. I’ll take a look and see if there’s a workaround for this, but you may want to consider upgrading to XAMPP 1.7.2a. Could you post your launchd configuration (.plist) file and tell me what port you’re using for Apache? I’ll test it on my setup. Yes I have the same issue. 10.6.2 – latest xampp – starts fine from terminal but does not seem to work like this. I’m using 10.6.2 and XAMPP 1.7.2a which appears to be the latest version released this August. Have you tried starting Apache from Terminal by typing sudo /Applications/XAMPP/xamppfiles/xampp startapache? Terminal should respond with something like XAMPP: Starting Apache…ok. If not, take a look at the Apache error log in /Applications/xampp/xamppfiles/logs/error_log for any clues. I’m going to run through my instructions again, but your issue may be due to the version of XAMPP you’re using. I’ve been trying to do the same thing – without success – in Snow Leopard using XAMPP 1.0.1. Which OS and version of XAMPP are you using?